Chanting with Kirtan Path is an experience that can transcend you to peaceful state of mind and open your heart. Pascale (harmonium/ vocals) and Mark (drums) welcome all faiths and backgrounds, the chants are easy and you are invited to sing, sway, clap and dance at your heart's desire! 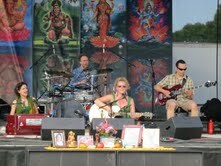 Past events include Bhakti Fest Midwest, Twin Cities Kirtan Festival, Inner Peace Festival, etc. They organize the annual New Year's Eve Kirtan Celebration and have regular events in the area. Their debut CD, Samgayati - A Gathering In Song , was released in June 2013. See their website or Facebook for details, a picture gallery & sound samples. Booking: pascale (at) kirtanpath.com. Mahajapa are a a group of Minneapolis based yogi-musicians devoted to Nada - divine sound. When leading kirtan (group chanting) they call on that divine sound to support the sacred practice of japa, the repetition of mantras. Blending melodic elements of traditional Indian devotional music and harmonic elements of Western music with primal percussion & modern grooves, Mahajapa drives kirtan participants into the sublime experience of a devotional trance with their unique Indo-Western sound. Susan Shehata (Sitara), Colleen Buckman (Kalyani), Keith Helke (Pavan Kumar) and Will Kemperman combine decades of musical expertise and theatrical performance experience, as well as a passion for yogic traditions, to create an accessible and uplifting kirtan. Events include: Bhakti Fest Midwest, Twin Cities Kirtan Festival, TC Yoga Festival, Common Grounds Yoga & Music Festival, Dave Stringer, Suzanne Sterling, Varsity Theatre, Project Earth, Harvest Fest, Shangri La music fests. EP released Summer ‘12. CD released Winter '12. The Wild Moon Bhaktas’ sound is born of the timeless folk rhythms and wide open mystic spaces that lie between the ghats of the Ganges and the banks of the Mississippi. The group – David Schmit, vocals, guitar and accordion; GaryWaryan, tablas; Dalyce Eliot, violin; and David Ballman, vocals, tambura and percussion – bring decades of performing experience, soulful vocals, and innovation to their sacred music. They weave readily learned beat-lively chants in Sanskrit and English with old spirit stories and the ecstatic poetry of Rumi, Kabir and Mirabai. They just released their first CD, From the Ganges to the Mississippi. You can find the Wild Moon Bhaktas on Facebook and the web.